Whether you're getting married or you're going to be helping the bride-to-be get organized, there's no one better (in my opinion) to help you get going than Colin Cowie. Colin Cowie is well-known as the wedding designer and event planner, and just some of the celebrity weddings he's been responsible for are those of Holly Robinson and Rodney Peete, and Don Henley. Other weddings he's designed but are not included in this book, are Kelsey Grammer's, Lisa Kudrow's, and Kenny G's. 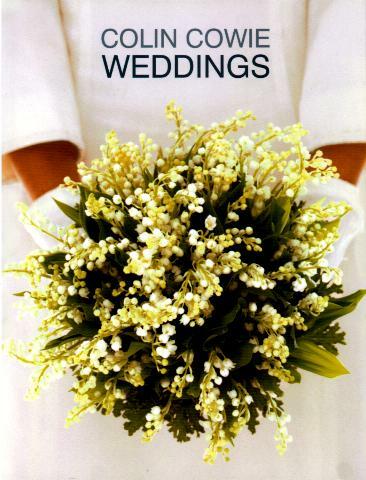 This book includes photo illustrations of the tables, flowers, wedding cakes, invitations, locations, happy couples, and family and friends, and much more. The planning and putting together of any wedding, big or small, is no small task and having the expertise of such a talented designer to hand, is something all brides should turn to for incredible ideas. Just look at the spectacular table on page 180 - magnificent. The tiny wedding cakes are a gorgeous touch, too - see pages 22/23. The reception room featured on page 79 is, simply put, awesome. Colin has included the questions he puts to prospective brides and grooms to get an insight to their likes and dislikes, which will apply to you as well. He covers the guest list, location, registering for gifts, thank-you notes, invitations, gowns, music, flowers (superb), menus, and so much more. There seems to be an endless list of things to do, but if you follow Colin's advice and plan carefully, you'll get through it with the least amount of stress. Be sure to check out the wedding cakes on pages 231-237. Colin is the Master! His advice is sound and solid. See my reviews of Colin's other books, Effortless Elegance and Dinner After Dark, and Colin Cowie's Extraordinary Weddings. Visit Colin at his website at www.colincowie.com. Conclusion - This is a book where you can learn to put together your wedding and not have a mediocre outcome.